In the nine-day Navratri Puja, the sixth day is dedicated to Goddess Katyayani. 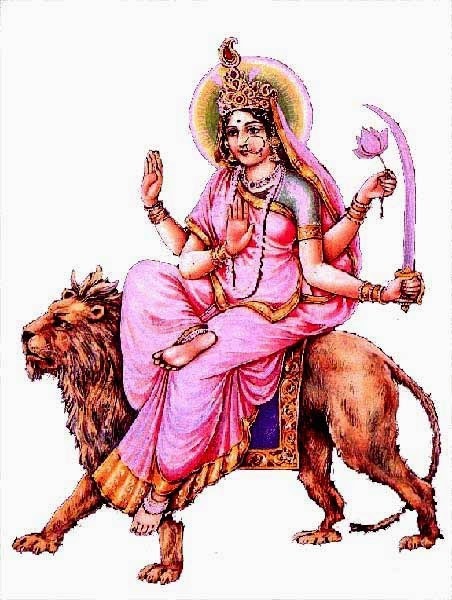 She is worshipped on April 11, 2019 during Navratri. The day is also the last day of Lakshmi Puja during Navratri. Goddess Katyayani form of Durga appeared as the daughter to Sage Katya of Katya clan and thus she got the name Katyayani. Goddess Durga is also worshipped as Bhairavi and Maha Kali on this day in different regions of India. In this form of Goddess Katyayani, Durga is both benevolent and malevolent. This is also a daughter form of Durga. She can bless and also destroy. She is depicted as having four arms and rides a lion. This form of Mother Goddess has control over Brihaspati Navagraha. Bhairavi and Mahakali aspect of Durga is worshipped on this day in western parts of India. The day is also observed as Durga Shashti day in Bengal, Orissa and other parts of Eastern India. As per Kalpurush Siddhanth, Goddess Katyayani has the power to alleviate all problems resulting from the ninth and 12th house of a person’s horoscope. She helps a devotee in following dharma. She blesses her children with love and luck. She also protects them from all kinds of diseases, damages and bad luck. She is to be worshipped facing northeast. She likes yellow color flowers. She is also offered yellow color sweet like besan halwa. She is also offered turmeric. Those devotees facing marriage related issue will find relief after worshipping Goddess Katyayani.